It’s no secret that food these days are loaded with preservatives. 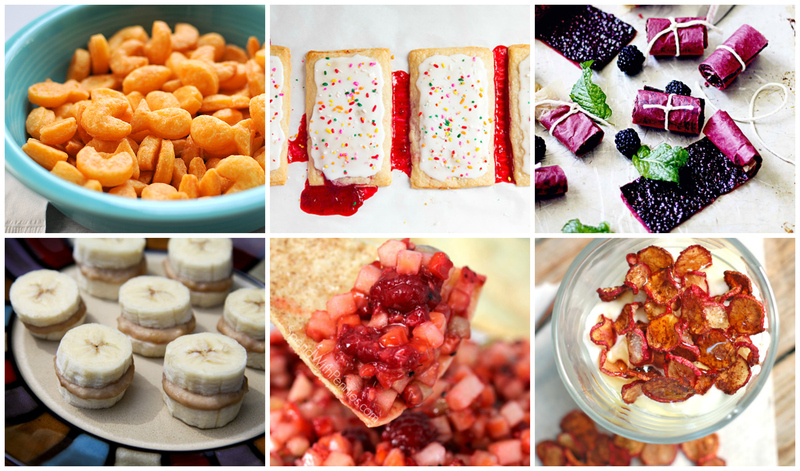 Try some of these recipes to replace unhealthy processed snacks with homemade delights. Click each photo for the recipe. Frozen Nutty Banana Nibblers from Jenny Sugar. We suggest using any type of nut butter and a pinch of cinnamon for this frozen bite of goodness. Fruit Salsa with Cinnamon Crisps from Holly at Spend with Pennies. Easy to make cinnamon tortilla crips and fresh fruit salsa. Blackberry Mint Lime Fruit Leather from Meredith for In Sock Monkey Slippers. This homemade fruit leather is a perfect blend of summer flavors. Cinnamon Sugar Radish Chips from Lindsay for Pinch of Yum. These healthy cinnamon chips go great with yogurt and honey. Homemade Goldfish Crackers from Miss Amy for Tasty Kitchen. An easy to make recipe for every kid’s favorite smiling snack. Homemade Pop Tarts from Cooking Classy. We love to use Sweet Lady Cook Jam or M Greenwood’s Jam for these toasty treats.